Dina is a highly experienced teacher who has been practising and studying yoga for 25 years and teaching for 23 years. She qualified to Junior Intermediate Level 3 in the Iyengar tradition covering various fields such as therapy, kids, pre and post-natal as well as regular yoga which includes restorative and breath work. She has inspired countless students of various ages and conditions and teachers alike. Dina was very fortunate to learn directly from Mr Iyengar very early in her studies of yoga, subsequently managing her own studio for 6 years until marrying and having two children. 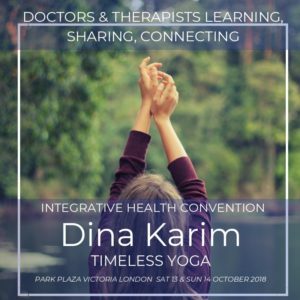 Dina continued to study with B.K.S.Iyengar and his family in Pune and here in the UK and still attends classes, workshops and intensive with his highly respected senior teachers regularly in the UK and abroad. Currently, Dina runs classes, courses and workshops at Triyoga Chelsea and The Life Centre Notting Hill, teaches at large public events as well privately, helping people to get an in-depth knowledge of yoga, to practice accurately, safely and to ultimately improve physically, mentally and emotionally and gain a healthy perspective on life. Whilst physical alignment, detail, appropriate props use and tailoring the practice to suit the student’s individual requirements is a consistent feature in Dina’s teaching, her real passion lies in imparting a true understanding of this ancient and timeless system of personal development and learning how, through the use of our inner resources, we can free ourselves from physical, emotional and mental disturbances, in order to live in harmony with ourselves and the environment and reach liberation.